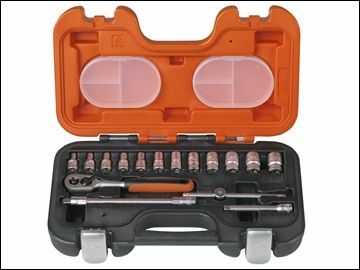 This Bahco S160 Socket Set 1/4in Square drive is a brilliant kit. it comes in an oil & temperature resistant polypropylene case. 10, 11, 12 and 13mm. 1 x 1/4in ratchet handle 45-teeth. 1 x 1/4in sliding T-bar 4in. 1 x 1/4in extension bar 3in. 1 x 1/4in flexible extension bar 6in.